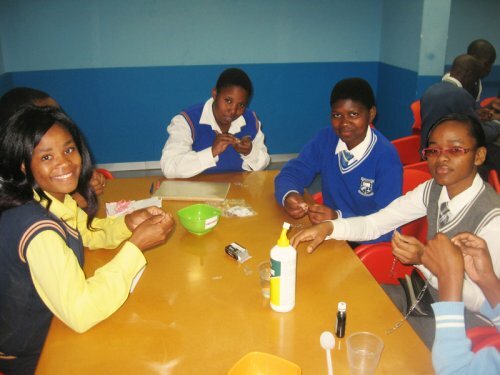 As an activity to commemorate National Science Week in August, learners participating in the Pongola Science and Mathematics Enhancement programme visited two Durban science centres. On 28 August, the learners participated in activities at the KZN Science Centre at Gateway, and on 29 August they attended science career lectures and a field visit at SASRI (the South African Sugarcane Research Institute) in Mount Edgecombe. These were important opportunities for these FET learners to obtain first-hand information on career choices. Through its 2013 new and improved education programmes, the KZN Gateway Science Centre assists schools to introduce their learners to the world of science and technology. Activities are based on the science theme celebrated each month. At the centre, the Pongola learners were taken through educational programmes on Biotechnology, Chemistry, Electricity, Mechanics, Sound and Waves, and Materials and Matter (Nanotechnology). The visit to South African Sugarcane Research Institute gave learners first-hand information on career paths in the fields of Agricultural Science and research. There is a shortage of learners interested in studying agricultural Science at tertiary level mostly because learners do not equate agriculture with Science. Young people often think that taking up a career in Agriculture is the same as becoming a farmer. They also believe that a career in this area is not financially rewarding. But learners were shown that a number of exciting career options are available in agriculture, and various research processes done by Sugarcane Agriculture were demonstrated for them. Each process requires a qualified person to do the research. Chemistry, Physics, Life Science, Geography and Agricultural Science are the main subjects needed, but the following are just some of the careers available within the field: biotechnologist, crop modeller, entomologist (studying insects! ), farm manager, GIS research officer, irrigation scientist, lab technician, molecular biologist, plant pathologist and scientific programmer. Most of these jobs were not familiar to the learners, who often only considered the more conventional engineering, medicine, teaching, etc. as career options. Opening their eyes to other choices could be a life-changing experience for many of them. On their return, during one of the Saturday sessions at Phongola Education Centre, learners were given the chance to share their experience with the others in the programme who had not been able to make the trip. They were also encouraged to share what they’d learnt with their peers at their respective schools. Learners have been encouraged to consider pursuing careers in science-related fields such as these, or at least to include them as second or third choice in the applications for tertiary study next year. Since few people know about or are interested in such careers, there are more opportunities in these fields of study. And there are also more job opportunities after completion of studies. Thanks must go to those at SASRI and the KZN Science Centre who hosted the learners, and to those at MIET AFRICA who organized the trip. But thanks also to SASA’s Sugar Industry Trust Fund for Education (SITFE), whose generous funding of the Enhancement Programme ultimately made the excursion possible. The impact of such a trip will bear fruit in the lives of the learners.